If you purchased CJES after my post on October 28, you have probably experienced a 20%+ gain so far. Not bad for a month and a half. But I think this one has got farther to go. The major market participants are funds and banks, so lets take a look at what analysts are saying about CJES. Of the five analysts following the stock, three have rated it a strong buy, and two have rated it a buy, with a mean target of 33, and a low target of 28. In addition, the perception of the underwriters was that the stock was worth $25-$28 per share back in August, and the stock opened above that, at ~$29/share indicating that the market perceived an even greater value. Now, CJES has paid down its debt and further proved its growth trends, it must surely be worth as much or more. Today, CJES surged ahead on the strongest volume that the stock has had since it came public. The strong buying volume indicates strong demand for the stock right now. The Momentum is strongly positive, and the RSI does not indicate overbought levels yet. CJES has paid down its debt, and had a 172% revenue growth rate for Q3 year-over-year. It grew earnings 225%. Wow. It has just deployed a sixth fracking fleet, which should add significantly to revenue for Q4. It is currently ordering its seventh and eighth fleets, which should add to revenue next year. CJES now has 75% of its operations in oily basins, making its fundamentals relatively immune to the low natural gas prices that have been affecting shale-gas production. Oil prices north of $80/bbl should be able to maintain a consistent demand, and with prices hovering near $100, CJES should not be facing any problems. Gas prices might also make a rebound, as today it was announced that stockpiles were lower than anticipated (1). If prices do not rebound, it will be because there is simply too much production going on, which, of course, is good for CJES. CJES pre-tax gross profit margin was 60.6% this quarter, which is slightly lower than last year’s Q3 profit margin of 62.6%, indicating slightly less favorable pricing for its services year-over-year (more on this later). However, its pre-tax profit margin was 32% as compared to last year’s 27%, indicating that the company is now able to leverage fixed costs like administrative expenses to gain greater revenue. Additionally, the fundamental trend of exploiting conventional reservoirs using horizontal drilling seems to be intact as well, with drillers reporting good results. Horizontal drilling requires more hydraulic fracturing. This seems to be one of the lowest-risk, highest return trades or investments that I can find. The problem here is that this situation may not be sustainable. Oil and gas service companies are not stupid. They have known about the trend of increasing demand for hydraulic fracturing for a while (i.e. years). The problems so far have been a) getting the capital to build frac fleets, and b) accurately deploying fleets to areas with the highest demand. Because the situation has been going on for so long, I expect that many of the major players have been adding to their fracking fleets in the same manner as CJES. There is a similar shale gas explosion going on in other countries around the globe, but they are even more constrained than the U.S. by the inavailability of fracking fleets. If fracking fleets will be deployed to other countries around the globe as quickly as they are manufactured, the state of supply/demand imbalance will continue in the United States, continuing favorable pricing for CJES. 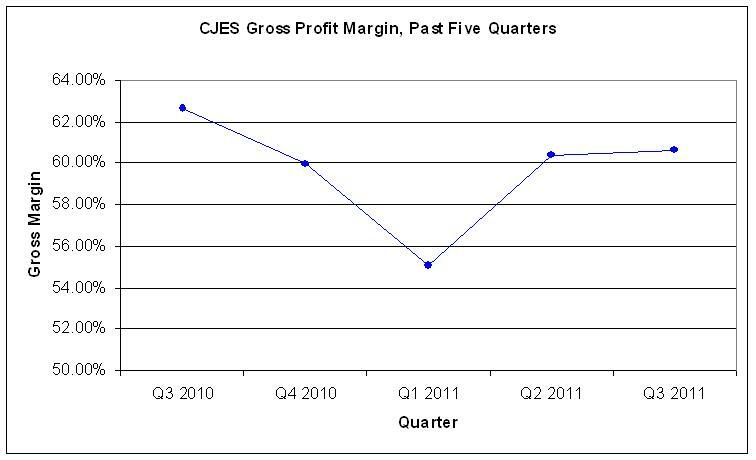 If not, then we may expect to see a decline in CJES’s gross profit margin. The gross margin took a dive in the first quarter, but has been recovering ever since. Because we are seeing growth in the margin quarter over quarter, I don’t think there is cause for concern… yet. The other risk I can see is a potential action by Congress to affect the hydraulic fracturing process. It could result in delays or increased costs for CJES. The question with this stock is not when so much when to buy, but when to sell. If you have not bought it, I would suggest the next few days as a prime time to get in. Let’s monitor this one closely, and get out before it busts. Disclosure: I own shares of CJES. I do not own shares of HAL or SLB. I am planning on adding to my CJES position in the next few days. The name Food Technology Service, Inc., is deceiving. When this company first came public, in the early 90’s, the name was appropriate. Food Technology Service (NASDAQ: VIFL) used to derive the majority of its revenue from irradiating food to eliminate pests and microorganisms. However, its business model shifted three years ago, leading to explosive growth. What is the fundamental shift? VIFL has begun to concentrate on medical device sterilization, and it now accounts for over 70% of VIFL’s revenue. In Florida, VIFL’s home state, there are only two gamma ray irradiators in operation for medical device sterilization, and VIFL is one of them, so the competition is very limited in this space. And because Florida is the number one destination for senior citizens (as measured by percentage of total population ), it has a thriving demand for medical devices. What exactly is involved in this process? VIFL receives medical devices from manufacturers, after the packaging and sealing process. These devices are then passed through a chamber where they are exposed to gamma rays emitted by Cobalt-60, a radioactive isotope of Cobalt. Then, the devices are given back to the manufacturer for transportation to the customer. The process leaves no trace of radiation, and no harmful chemicals. The advantage of such a process is that sterilization can happen after the device is completely packaged, because gamma rays can pass right through, eliminate any microorganisms on the device itself, and leave no trace. However, there are risks associated with the any radiation process, namely to the employees, but with a CEO with a Ph.D. in Environmental Health, I think that these risks can be mitigated. In fact, there are two Ph.D.’s on the board, in addition to a radiation safety officer, which is a good sign for such a technology company. As a value proposition, VIFL makes sense. Its current assets, consisting of cash, deferred tax assets, prepaid expenses, and accounts receivable, make up 18% of its market cap. Its property, plant, and equipment assets make up another 31% of its assets. These consist mainly of the vast amounts of stored cobalt that VIFL must keep in its warehouse to generate gamma rays. So only half of VIFL’s current market cap of $15.11 million is derived from its earnings power (i.e. It is trading at twice the book value). And its earnings power is incredible. The company makes its earnings at a consistent 20%+ profit margin, which suggests a large moat against competition, since it can price so advantageously. The pre-tax profit margin has been increasing, showing that the company is able to leverage growing revenue against the relatively fixed costs of operating its facility. This trend should continue, if revenue continues to increase. This shows the trend of increasing earnings continued through the recession. This gives me some confidence that this is a fairly recession proof stock, as there is demand for medical devices in good times and bad. The company holds no debt, and is sitting on a large cash balance of approximately 10% of its market cap. The company made a return on equity of 19.0% in the trailing 12 months, which is a fairly good return. I try to look for companies that have a ROE of approximately 20. The main risk probably stems from its customer base. VIFL derives over 50% of its revenue from just three customers. If any one of these customers were to terminate its relationship with VIFL, it could be disastrous for VIFL’s earnings. However, with only one competitor that these customers could switch to, this risk is not terribly large. But it is still something to be considered. A second risk emerges from the capital costs associated with maintaining an adequate supply of cobalt-60. The cobalt has a half-life of 5.27 years, so must be replenished accordingly. The cobalt is not replenished at regular intervals. Instead, the company takes advantage of low prices in the cobalt market to purchase cobalt opportunistically. The company maintains a buffer on the amount of cobalt stored, so that there will be enough cobalt to generate the levels of radiation necessary to meet customer demand. The company only spent $81,000 on cobalt in 2010, or 7.6% of their operating cash flow, because it got a great deal on cobalt from its supplier, Nordion. However, in 2011 so far, the company has spent $901,000 on cobalt, which translates to 62% of operating cash flow. As long as cobalt prices do not return to 2008 highs, the company should have no problem financing its cobalt purchases and having free cash flow left over to build company value. A third risk emanates from the fact that this is a micro-cap company. With a market value of $15.11 million, the stock is prone to volatile swings when big volume moves occur. Historically, in a recessionary environment, volatile micro caps can get punished, despite strong fundamentals and a lack of influence of market pricing on fundamentals. Therefore, do not purchase this stock unless you are willing to sit out a large drop in the price. For those who were patient, the stock doubled from its 2007 highs, and was a 6-bagger from its 2008 lows. Nordion, VIFL’s cobalt supplier, was previously the parent company of VIFL. However, it has sold all of its shares as of February of this year. In 2010, the stock price was depressed by this selling activity. When Nordion’s shares were finally completely sold off in February 2011, the downward pressure on the stock was released. This is the reason the stock has been able to rise so much this summer. It shows the beginning of a bull run in the stock in March 2011, immediately after Nordion finished selling all of its shares. Now, we are in the second of two tests on the stock price. I believe this is merely a dip in the middle of a bull run, which is usually a good time to buy technically. Further, the Relative Strength Indicator is below 30, which indicates an oversold stock. With a P/E of roughly 18, the company sits below the S&P 500 P/E ratio of 26.3. The company is sitting on a 23% revenue growth rate, and a 38% pre-tax earnings growth rate*. This earnings growth rate would give the stock a PEG ratio of .47. Generally, a PEG ratio below 1 is desirable for a growth stock. Further, if we were to subtract cash out of the market cap, we would arrive at a cash-backed out P/E of 16. This would give the stock a PEG ratio of .42. Lets take a look at the free cash flow, to see how much of the company’s earnings are actually translated into cash. For the first 9 months of 2011, the company converted 57% of its income into free cash flow. In 2010, the company converted 62% of its income into free cash flow. The effect of the different cobalt prices on the free cash flow was a large portion of the difference. Using the 2010 free cash flow figure, we arrive a price / free cash flow of 21.2 and a cash-backed out P/FCF of 18.9. This is still below the revenue growth rate, and the earnings growth rate, which is a good sign. This is a stock that has room to run, and is growing at a phenomenal rate. The facility that Food Technology Service owns is licensed to use 4.5 times the amount of cobalt that they are currently using, so the capacity to grow is there, provided the demand grows. And with an aging senior population in the most popular senior destination, the demand for medical devices in Florida is likely to grow. I think it is reasonable to expect the price to go up enough that the P/E matches the growth rate, which would be near $10 or so, a double from its current price of $5.40 a share. I believe it is almost certain to revisit its 52 week high of 7.93, which would be a 50% increase. However, because of VIFL’s high volatility, the stock may swing lower before it goes higher, and, if the entire market crashes because of a European credit crunch, the stock could fall more than the market. Any price below $5 a share is a steal. I was lucky enough to get some shares below $5 on the last dip, and I’ve already purchased more at $5.40. If the stock crashes, I will certainly be loading up. This seems to me to be a relatively recession-proof stock. As the company continues to generate cash from its current customers, the balance sheet should bulk up and the market value should increase. This is a great stock to buy and hold for the next few years. Disclosure: I own shares of VIFL. I may purchase more shares in the next few days. *I used the pre-tax earnings growth rate to negate the effects of tax benefits, which do not depend on the fundamentals of the business.